I'm using an older RCBS Lube-A-Matic to size and lube some bullets for the first time and not finding the process fun. I can't seem to get the lube (Lyman Alox) to get all the way around the bullet, the stuff oozes out of the top of the bullet and overall it's a mess. I'm using a Lyman heater underneath the Lube-A-Matic. Is it necessary with the Lyman Alox? Any tips to make the process less frustrating? You're pushing the bullets too deep. So nlong as the lube is 90% full they should shoot OK. But ALOX is overkill for pistol bullets. Wobbley wrote: You're pushing the bullets too deep. So nlong as the lube is 90% full they should shoot OK. But ALOX is overkill for pistol bullets. Yes, I need a little more patience and fiddle with the depth adjustment. But why is Alox overkill? It was recommended more than once here for pistol bullets over some of the harder lubes. Aloxwas formulated to allow cast rifle bullets to shoot at 1500 fps or above. We're not shooting at those velocities. It will work but is overkill. Wait until you start pan lubing 540gr .459 bullets for black powder cartridge rifle. Then you will discover messy. But you get used to it. You'll get used to lubing the .32 as well. 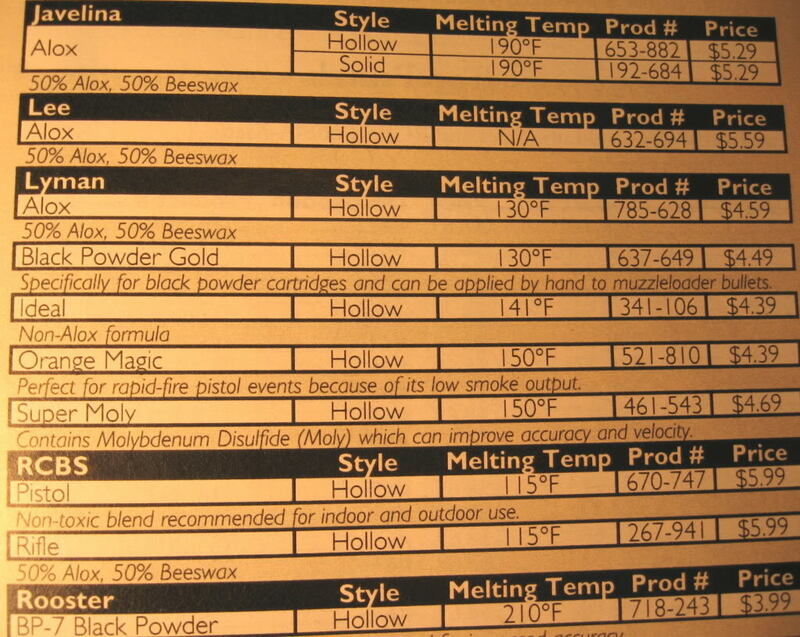 Wobbley wrote: Aloxwas formulated to allow cast rifle bullets to shoot at 1500 fps or above. We're not shooting at those velocities. It will work but is overkill. The stuff I'm using is called Alox Bullet Lube by Lyman, which apparently is a mix of something. I also purchased a stick of RCBS pistol bullet lube that appears to be the same. Heat is not needed for some lubes if room temperature is 70 F degrees or highter. Make sure holes in die are open before placing in sizer. I have used both the Alox 50/50 and Xlox 2500 from White Label and they work well in everything from 38 through 45 as well as in rifles. The Xlox 2500 is less sticky and I use it now instead of the original formula 50/50. There are other lube makers as well who make good lubes, only real issue is whether you need a heater to soften the lube sufficiently to work through your sizer. I use a Lyman 450 which is basically the same as the RCBS and the Xlox 2500, though a bit stiffer and less tacky works without a heater. The Alox formula lubes work far better than the old lubes, and you need to experiment to see if you need to fill all the lube grooves. Most cast bullet designs date to pre Alox based lubes and needed to carry a lot of the old style lube. Experiments by E.H. Harrison, published in the American Rifleman, demonstrated that Alox based lubes needed only one groove filled vice the normal three grooves need with old lubes. 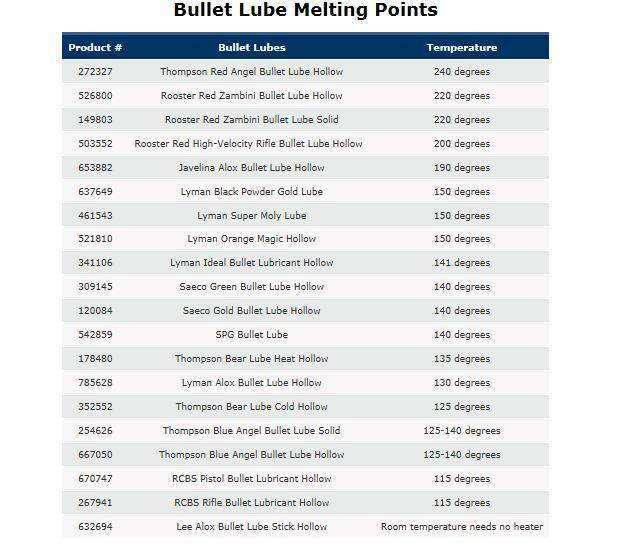 That was in 38SPCL, not sure of what your bullet design has for lube grooves. If you have lube going everywhere you are definitely pushing the bullets too deep into the die. Only go in far enough to fill the grooves, An even fill is what you want, but the occasional thin spot should not be issue, a little ALOX based lube goes a long way at pistol velocities. The only other issue with lube is how dirty it is, some tend to leave more residue in the gun. The harder lubes, as a rule, tend to leave less than the softer lubes. The lube vaporizes slightly and the vapor picks up powder residue, and then condenses back onto your pistol. All lubes do this, but the higher melt point lubes do it a less. If you have a gun with tight tolerances you may need to clean more frequently, or experiment with different lube's and powders to see what burns cleaner. Beezer, You can also get lube all over the place by cranking on the feed screw too hard. It's a balancing act. That is why I like my Star/Magma sizer luber so much. With the air feed for lube and the design of the dies that lines the feed holes up with the lube grooves you can get the thing to fill the grooves just the way you want them. The heater base also allows you to tailor the softness of whatever lube you like. The push through design with the feeder allows you to crank through a bunch of bullets without much fuss at all. Fill the magazine with bullets and pull the handle. It can be a bit of a booger to get set up but once you get the hang of it it's a great piece of gear. The problem was the result of the Adjusting Screw not being long enough for the Ejector Rod to make contact with the pin inside of the sizer/lube die. Without that contact there is no way to adjust the depth of the bullet in the die. The solution was to remove the Lock Nut and place a small spacer between the head of the Ejector Rod and Adjusting Screw. The problem was totally unique to the small bullet size. Everything seems to work fine now. Thanks 243winxb for posting the lube charts and info. That was very helpful. First, why not try NOT sizing the bullets and tumble lubing them in LLA or White Labs 40:40:10 and see how they perform? I found that using as-cast bullets were always as accurate or more accurate than sized bullets. If you try it, you might just like it.